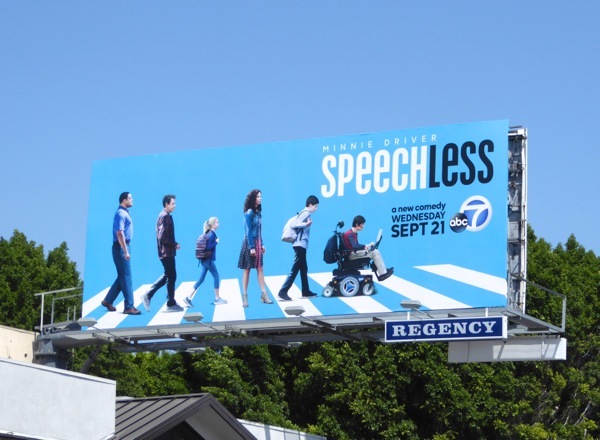 Unlike some networks who seem to offer up the same type of sitcoms year after year, ABC has had some success in breakage the mold with diverse offerings in recent times like Black-ish, Fresh Off the Boat and The Real O'Neals. 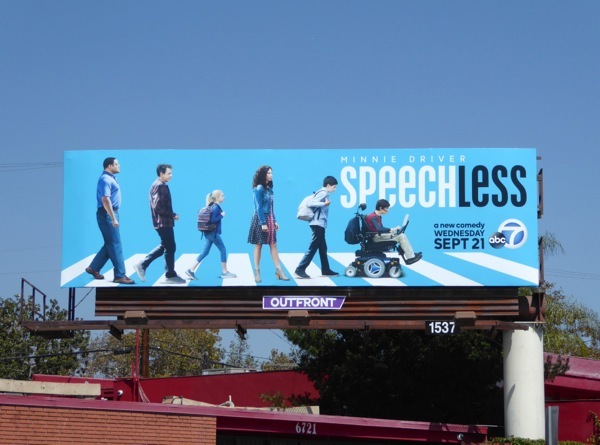 This Fall Minnie Driver stars in a new comedy about a mother on a mission, fighting for her family, the 'DiMeos', like her husband The Big Bang Theory's 'Barry Kripke' (John Ross Bowie) and her eldest son 'JJ' with cerebral palsy, played by real-life disabled actor Micah Fowler. 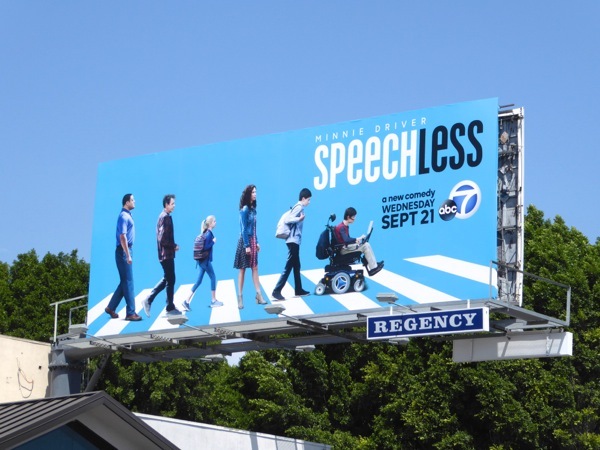 The show follows 'Maya DiMeo' and her clan as they try to settle into a new neighbourhood, whilst she battles injustices real and imagined, at the same time trying to find the right person to help give her non-verbal teenage son a 'voice' (hence the series title). 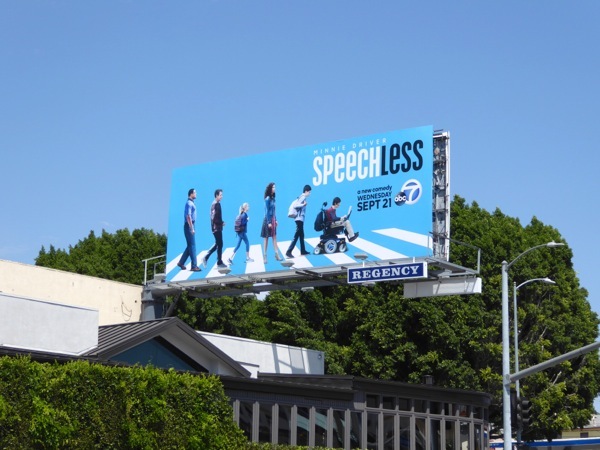 This series launch ad creative for Speechless, which features the sitcom's cast on a pedestrian crossing, is a nice homage to The Beatles iconic 1969 album cover to Abbey Road and really stands out this new season in the city skyline. 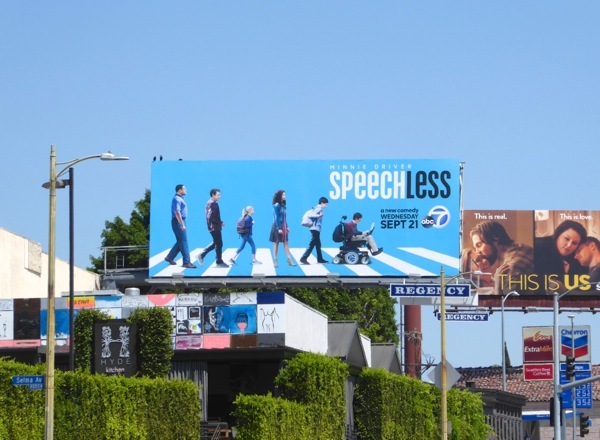 These Speechless series premiere billboards were first spied along West Hollywood's Sunset Strip on August 22, then later above Highland Avenue on September 3 and along Melrose Avenue on September 6, 2016. 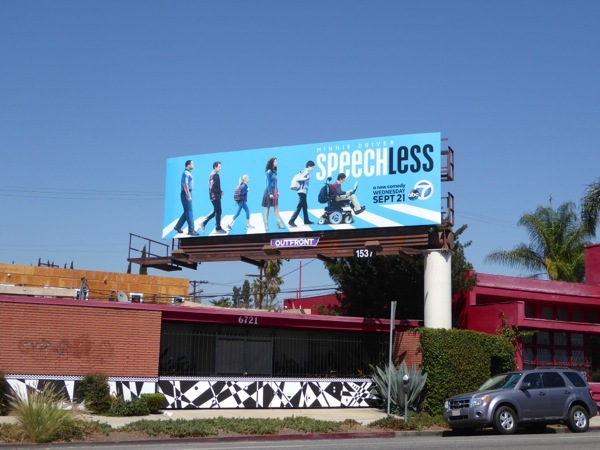 Fans of Minnie Driver can also check her out in this About a Boy TV series billboard. 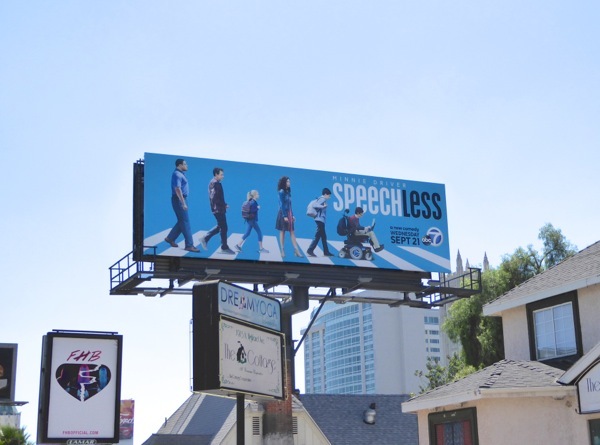 Comedies have a great way of tackling everyday challenges and getting audiences to see things like race, sexual orientation or disabilities in a different light, so let's hope Speechless will offer something that's refreshing, enlightening and most of all funny this new TV season.